Marianne was recommended by a fellow realtor who valued her combination of warm ease, underpinned with deep experience and uncompromising professionalism. My home is my largest asset, therefore, it was important to be completely frank discussing the nature of the transaction, without disturbing our working relationship. Marianne understood each concern, bringing practical and focussed insight to bear. She informed me of trends, however never lead me to a conclusion or assumed my preferences. She listened, commented and allowed me to come to my own place of comfort, based on solid information. My home and privacy were secure in her hands - in two instances, Marianne moved with uncompromising action to address unprofessional behaviour by others in related fields. She was able to do all the above, and bring the deal to a satisfactory close, with decorum. I would recommend her without hesitation. 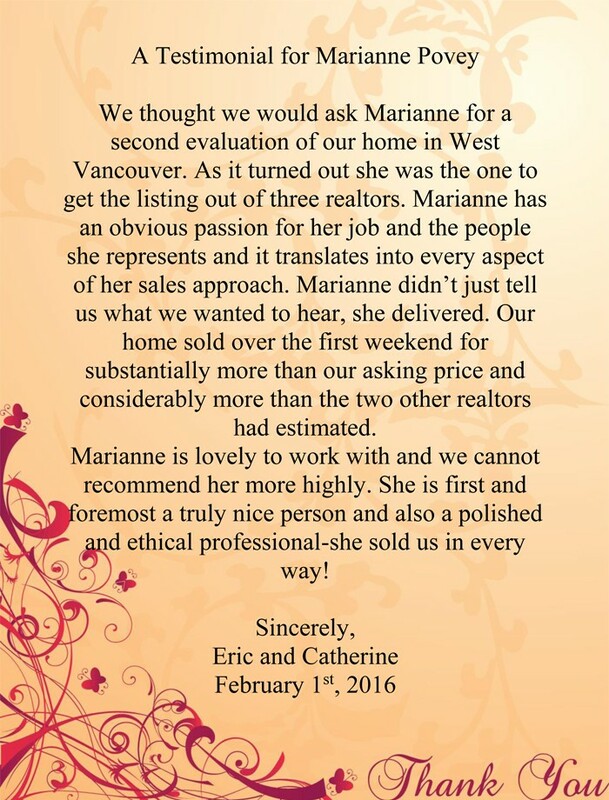 Dear Marianne It has been such a pleasure selling my home through you. From the very beginning you were organized, with comprehensive explanations of every process and stage. you were always in touch, prompt with communication, innovative in promotion and thorough in assessing value. Most of all your positive attitude was such an asset. I would not hesitate to recommend your services. Thank you . Your professionalism was most appreciated. December, 2014. "I have just completed my third house move with Marianne's wonderful help. On every occasion, I have been delighted by her attention to every detail, and answers to the issues we have encountered along the way. Marianne is unfailingly pleasant, supportive and positive, and always available, as she limits the number of clients she represents at any one time. I have no hesitation in recommending her services." August, 2013. "If you want a Top Notch professional Realtor who will bring all of her experience to bear on all aspects of the sale of your home - CHOOSE MARIANNE POVEY! To anyone who reads this I recommend Marianne with all sincerity. She sold the home in 5 days and got $31,000 more that we were asking. I never felt pressured or unsure with the preparations Marianne recommended. At the end of the 5 day sale period she went me not ONE but FIVE offers. If I had the qualities I recognized in you I would still be in real estate. We really appreciate everything you did for us - your advice and your professionalism has meant a great deal to both of us. Thanks again for helping us find our house - your experience made it happen. On behalf of the faculty and students involved in the fourth year Negotiations course, we would like to thank you for your generous contribution of time, energy and knowledge. My wife and I were very pleased with the sale of our home. It sold quickly, and with a minimum of disruption to our lives. A very stressful time was made much more pleasant by you. Excellent service overall. Thank you very much!